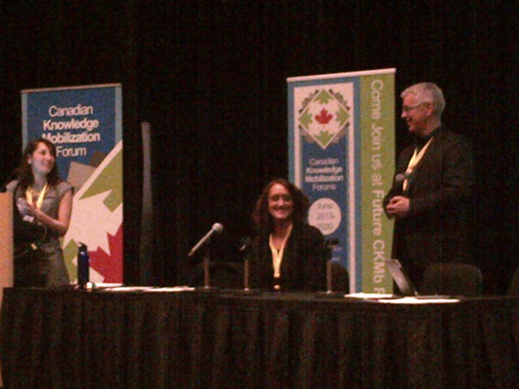 This past Thursday May 14, 2015 and Friday May 15, 2015 the 2015 Canadian Knowledge Mobilization Forum took place at the Grand Bibliotheque in Montreal, QC. The Canadian Knowledge Mobilization forum is the national conversation on KT/KMb practice and an excellent way not only to build our own skills but to brand NeuroDevNet as a leading KT organization. 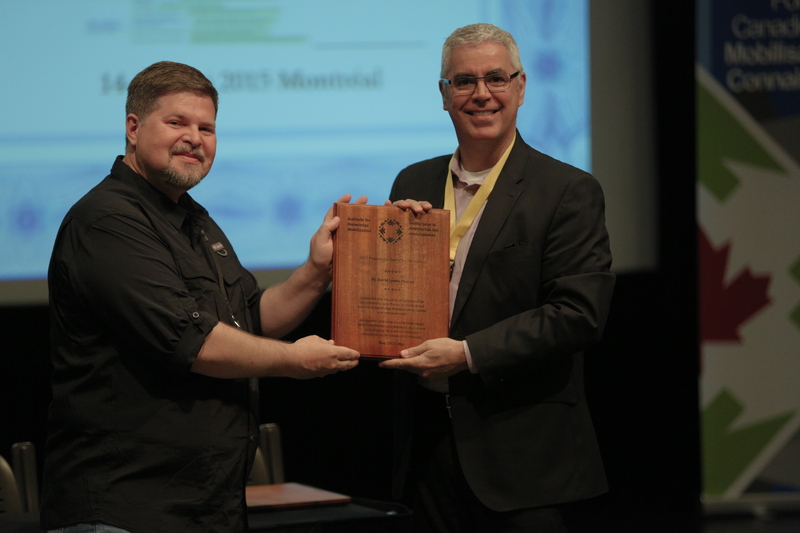 In fact, it was during this event that David Phipps (NeuroDevNet KT Lead) received the “2015 President’s Award for innovation” in “recognition of his extraordinary contribution to the field and practice of Knowledge Mobilization in Canada and internationally”. The overall theme of the conference was “Creativity as Practice: Mobilizing Diverse Ways of Thinking”. I both learned from other presenters, and shared my own knowledge. In the workshop “Narratives, video and smartphones as KT tools for youth” (by Sean Muir) I learned that the ‘formula’ for maximizing effectiveness of KT with youth is: grab their attention with a shocking image or story, present your content/message, and then end with something positive. Sean used examples of videos and posters to illustrate this point. In the workshop on “Mobilizing your message through documentary video: research findings as cinematic narrative” (Callista Haggis et al.) the takeaways for creating KT videos were “done is better than perfect”, “show don’t tell” and “think about what you want your target audience to think, feel, do”. In this case, the documentary was both to present research findings in an alternative format, as well as to inspire discussion about the issues presented in the video toward possible infrastructure changes to accommodate the needs of an aging population. 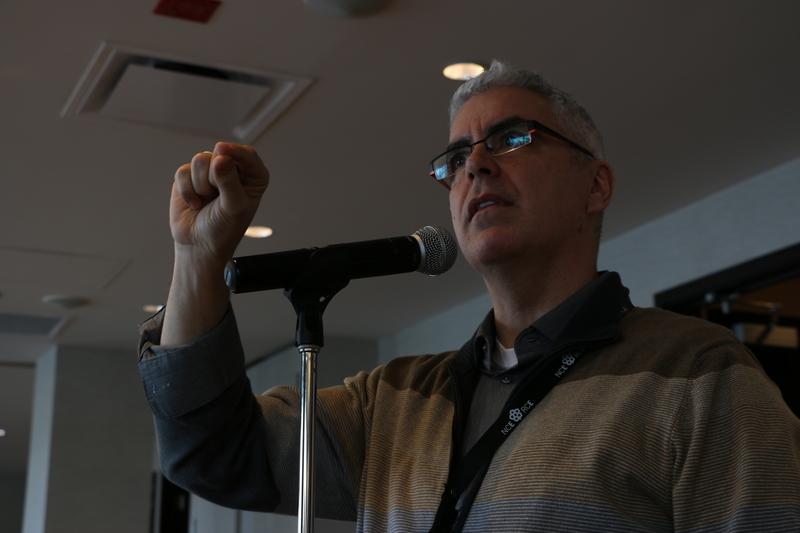 NeuroDevNet’s KT Core Lead, David Phipps, participated in leading 2 sessions. One session was with Purnima Sundar (Ontario Centre of Excellence for Child and Youth Mental Health) and Renee Leduc (NCE Secretariat). The audience gained insight into the 3 common reasons why research grant applications fail: 1) lack of meaningful end user engagement, 2) unclear pathway to impact, and 3) poor evaluation of KM (Knowledge Mobilization) and of impact. The NCE Secretariat provided tips on how to prepare a successful research funding application, and held an interactive session asking for the audience’s ideas for what the NCE Secretariat could do to help applicants be more successful. Ideas included: successful applicants’ mentoring of new applicants, creation of how-to videos to accompany written grant application instructions, and provision of examples. David moderated the session on “the paths of sustainability for KMb” in which I was one of the 4 presenters. I presented on the KT Core’s evaluation framework, indicators, and 3 factors relating to sustainability: relevance (how does what we’re doing fit with our priorities), leadership (who is responsible for ensuring outcomes are met), and financial (can cost-effective strategies be used). The presentations were 10 minutes each. When the presentations were over, each presenter took their discussion question to a corner of the room and invited attendees to join their group (depending on which question most interested them) and discuss it further in terms of their own context. – How are people attempting to influence sustainability across diverse settings with the use of tools? – How can we sustain KT implementation through strategic planning? – How can team capacity and culture be shaped over time to best meet the needs of knowledge users? – What factors should be considered with respect to sustainability? I had about 12 people in my breakout discussion group. Although I had a discussion question prepared, I received several questions about what NeuroDevNet’s KT Core does in terms of evaluation and also about database design and development. After the breakout discussions we returned to the large group and each presenter did a ‘report back’ about what their group discussed. If you are a NeuroDevNet researcher or trainee and would like help with KT videos, advice on event evaluations and/or evaluation of your other KT activities and products, contact the KT Core to find out how we can help. The REF officers and other research administrators interested in research impact gathered for a one day ARMA workshop to look beyond REF 2014. This included looking towards REF 2020 as well as beyond the narrowly construed REF frameworks including university research expertise (faculty and graduate students) that is engaged beyond the academy. I used Melanie Barwick’s KT Planning Guide (click the link and enter your e-mail address to get access to the tool) as a tool to help the UK impact officers look beyond REF reporting on past impacts and start to create the conditions to enable future impacts. 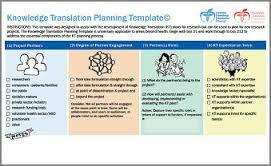 This planning guide asks researchers to consider 13 elements of a KT framework. Working through those 13 elements provides the raw material to then craft the KT strategy. The KT planning guide (elements 1-3) asks the researcher to consider the types and roles of partners in the research. Partners are the individuals/organizations who are along for the ride. They are co-producers of research. They help disseminate research results. They co-supervise students. They provide cash and in-kind (space, data, populations, equipment) resources to the research project. The KT planning guide also asks the researcher to consider types of research users (element 5). These are individuals/organizations that take up the research evidence and use that evidence to inform decisions about public policy, professional practice and social services. The NCE Secretariat calls them “receptors” or “knowledge users (KUs)”. Both partners and receptors/users are critically important to the research to impact process. 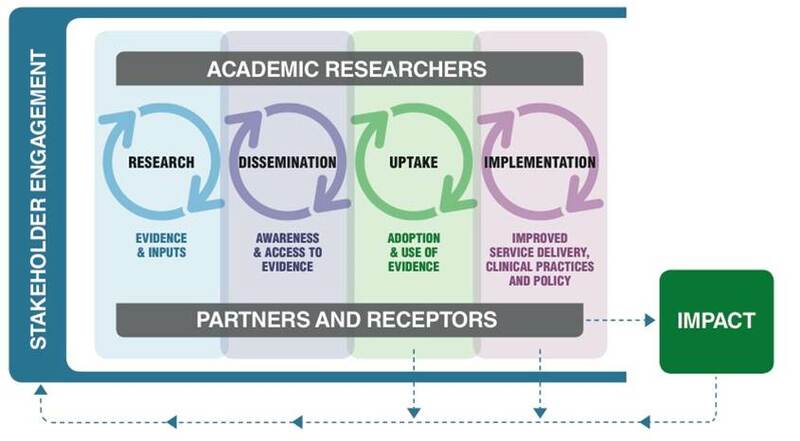 The co-produced pathway to impact outlines the pathway from research to impact on the lives of children with neurodevelopmental disorders and their families. Partners collaborate throughout but receptors only become involved after dissemination. Research partners will likely be research users but research users are not always research partners. In the ARMA impact workshop one Impact Officer was convinced that research partners and research users were the same. After I explained the difference she remained unconvinced. That’s when I said, “If you want your research to have an influence on early childhood literacy practice you’d better not be partnering with the fire department”. Research users need to be coherent with research partners because one informs and/or has access to the other. For NeuroDevNet’s social ABC’s intervention led by Dr. Jessica Brian from Holland Bloorview as part of the Autism Discovery Program, the research partner is Humber College which has two full-time community-based childcare settings. Humber College’s practitioners-in-training will help develop and evaluate the intervention. The knowledge users will be early childhood centres and day care centres across Canada who will put the research evidence into practice by using it to support early childhood learning. The KT Core will work with Dr. Brian and her partners help identify these receptors/KUs and broker collaborations so that Social ABC will be implemented and evaluated beyond the research project setting. If you want the KT Core to help you find partners and receptors/users to help translate your research into early diagnosis, validated interventions and supports throughout the life span please contact the KT Core.